A mom had always cut off the ends of her pot roast before cooking it because that’s what her mom had done. Her daughter did the same but one day questioned her mom about why they were doing this. The mom, in turn, asked her mother who said that back then their pots weren’t big enough for the roast so they trimmed the ends to make it fit. Doesn’t this ring true about a lot of things in life? Our beliefs and views about so many things goes way back to what our parents learned from their parents, who learned from their parents, and so on. Many times we just accept the way things have been done without question. This definitely shapes our mindset about wealth. If we grew up hearing limiting beliefs “money doesn’t grow on trees, only the rich get richer, we can’t afford that, money is evil” it creates a cycle until those beliefs about money change. One way to change limiting beliefs and break the cycle is to replace them with positive affirmations about wealth. These affirmations are statements that begin to change our thoughts and motivate our actions. It creates a different cycle that leads to results. You can create your own affirmations. The way to do so is to determine which area about money is your biggest source of frustration. Let’s say it’s living paycheck to paycheck and not having any money left over. 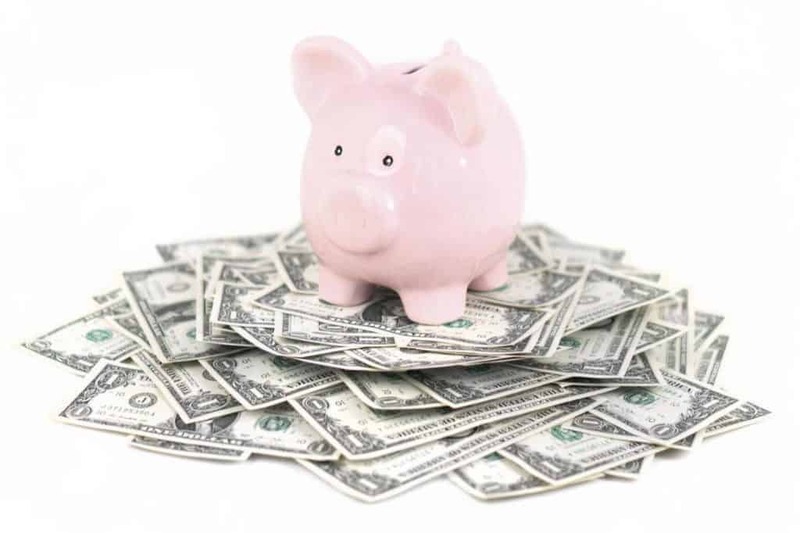 A limiting belief may be “I’ll never have more money.” But if you begin to change that thought to “I will find ways to make more money and grow my savings” then you’re on the path to changing your current situation. You can also see if any of the limiting beliefs below are holding you back. Replacing them with the wealth mindset affirmation is a huge first step in believing that you are capable and deserving of having wealth. #1- There is more than enough money available to me. An mindset of abundance creates a healthy relationship with money. Without it, we’re always scared that there’s not enough and it’s only available to people who already have it. The truth is there is more than enough money available for you and me. Creating wealth and financial independence is available to everyone. There is enough of the money pie to go around! If you don’t believe that money is available to you, then you have created a boundary and set limits on your potential. When you think about the flow of money and can visualize how it constantly moves, you remove those barriers of thinking about money as a scarce resource. #2- It’s safe and good for me to become wealthy. Somewhere over time people with money became associated with being greedy or dishonest. We think of Scrooge counting his coins in a dark, lonely room and don’t want to be like that. Whatever you do with your money now, wealth will be a bigger version of that. If you send care packages to soldiers, you’ll be able to send more. If you participate in adopt a child at Christmas, you’ll be able to help more families. Your wealth will not change who you are or your guiding principles. There’s no reason to harbor a fear of becoming wealthy because of a negative mental image of what that looks like. Money can be used to do awesome things to make our world a better place, it’s safe and (better than) okay for you and me to become wealthy. If an 8 year old can spend his money to do this, then I can’t wait to see what he’ll do with future wealth! #3- My money comes to me from different sources. What’s the first thing that comes to mind about how money gets to your bank account? Most likely you think of your paycheck or job. However, money has more potential to find it’s way to your pockets than just a regular day job. When you are open to different opportunities or potential investments, the result is a faster pace to wealth. You will begin to find different paths to diversify your income and perhaps even land on a side hustle that leads to even greater opportunities. #4- Money is a tool that will make my life better. It’s true that money does not create or buy happiness, but it is a tool used to make life better. It has potential, when used with purpose, to create the kind of life and experiences you want. Your money is not the enemy, you are on the same team and have to work together! When money is managed well, it improves your overall outlook on life and your health. Your health is the biggest and most important investment there is. It is reason enough to work on our money mindset! #5- It’s okay for me to talk about money. It’s okay and important to have real conversations about money and finances. In fact, that is how we learn and find success. If you’re not yet comfortable talking about money among your family, then you could become part of an online community. Another great place to hang out with a lot of people who like to talk about money all day long is Twitter. In both our businesses and finances, what we focus on and discuss gets improved. #6- Money will help me solve problems for myself and others. Money is not the problem or burden some make it out to be. Instead, financial peace of mind reduces stress. If we create a positive relationship with money, we’ll free our minds to find more solutions to problems for ourselves and others. I believe this is a key belief of those with a millionaire mindset. They use money to solve problems which generates more money… to solve more problems. #7- I’m thankful for my present and future wealth. Being thankful for our present and future wealth is key to staying positive and focused on our goals. An extension of mindset is visualization. One simple way to visualize your present and future wealth is through creating a financial vision board. 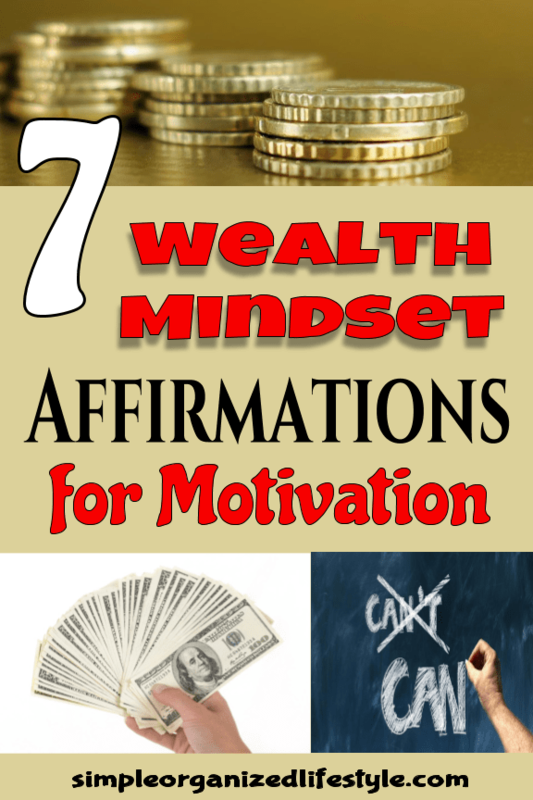 It’s a simple way to stay motivated on your wealth affirmations. When you change your thoughts, motivation increases and new habits develop. What are some of your own wealth mindset affirmations? By changing your limiting beliefs to positive affirmations, your actions will change and results will follow! Great post! I’m a big fan of points #1, #5, and #6. Overcoming the scarcity mindset is a big one. This paradigm shift can be helped by knowing that an hourly wage of just $15.58 on a full-time basis ($32,400 annually) puts one in the world’s top 1% by income. I wish it weren’t socially taboo to discuss finances, particularly since financial literacy isn’t taught in schools. Financial illiteracy is all that is holding back many people from being able to achieve financial freedom. I do my best to promote discussion on this topic amongst friends and family in the interest of increasing shared knowledge. Agree! I try to do the same but many people are so hesitant to join in on any conversation related to finances. I could talk about it all day lol. Thanks for commenting! This is awesome. Definitely affirmations that I need to starts using.